Many of you come to this web site looking for information about American kilts. So naturally enough I wrote a page for the web site, and called it Contemporary Kilts. It isn't about traditional Scottish/Irish kilts, it's actually about companies who manufacture contemporary non tartan kilts. However many of you who have visited this site, and have read that page are surprised by its content, why? because it seems you expected to find a page giving information on traditional kilts being made in the USA or Canada. So that's exactly what this page is about, kilts that are made on the American continent, using traditional kilt making skills, and of course Scottish made tartans. There are many retailers of scottish and Irish kilts stateside, and many of them actually import kilts which are made in Scotland. And that is perfectly understandable, as many people wish to own a kilt that has been hand made in Scotland by traditional kilt makers. However the fact is that there are many highly skilled traditional kilt makers living and working in both America and Canada, and that means you can have your kilt made there, to exactly the same high standards as one shipped from across the pond. Just to give you an example of the fine work carried out by kilt makers in the States, have a look at the photo below. 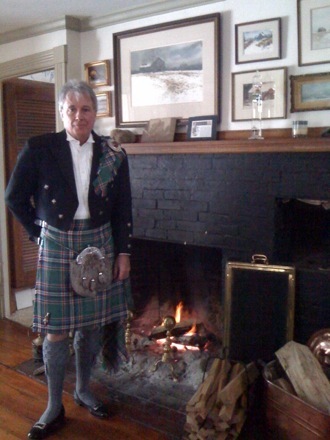 Jim owns four kilts, all of them have been made by the same kilt maker in the States, and he has contributed many photos to the site, if you would like to see more of Jim's photos, then please visit the your kilt photos 2 page. Kilt making as you can imagine is a skill/craft that is passed from generation to generation, and as such, so long as the material is woven on Scottish looms, it doesn't matter which continent the kilt maker happens to live and work. One more example is the kilt worn by Jim in the next photo. Jim bought the tartan in Scotland, at the Lochcarron Mills in Selkirk, and had his American kilt maker make him the Buchanan Weathered Old tartan kilt, seen below. Because of the huge difference in the population of both America and Canada compared to Scotland or Ireland, there are actually more kilts produced stateside than there are in Scotland and Ireland combined. One major reason for this of course is history, with over twenty million Americans claiming Scottish ancestry (that is almost four times the population of Scotland) it is little wonder that so many of you wish to reconnect with your Celtic heritage. The number of pipe bands across the continent are also increasing, and these bands more often than not are having their kilts, and indeed the rest of their uniforms made at home. Many of the kilt making companies maintain strong links with Scotland, both cultural and commercial, so you can rest assured that by having your kilt made stateside rather than in Scotland or Ireland, you are not compromising on quality or craftsmanship. And with the exchange rate as it is at the moment, you may well find it costs less to have it made at home. If you would like more information about having your kilt made in your home country, such as which is the best kilt maker in your area, or any other kilt related question, then simply drop me a line using the "Contact Us" page.